rocket.superb : images and things: El Chupacabra Awareness Week! 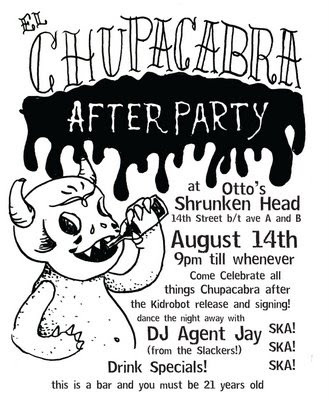 Sara Antoinette Martin's long-awaited El Chupacabra Vinyl Toy release and signing is this THURSDAY 8/14 from 6 - 8 pm at the Kidrobot NYC Store!!! These limited editions are almost extinct so don't wait to pick up yours!